I don’t know if I’d say we’re experts on recording, but we’re definitely very experienced. We’ve carried several different kinds of recording devices to try to help customers record long running late night talk radio shows. cassettes on a different device. We carried some of these through 1999. The Reel Talk arrived in 1996 – This seemed like the answer to all our problems. Built-in radio and speaker. No auto-reverse, but it could record at slow speed which would give approximately 4 hours on a 120 minute cassette tape and it had a programmable timer. Unfortunately it wasn’t the most reliable product. That said, there were a lot of people who loved this recorder and used it every single night to record Art Bell. The CC Recorder: This was our first foray into our own design of a recorder and it was way ahead of its time; a little too far ahead. It was an actual hard drive with a multi-event programmable timer. It could record up to 115 hours at lower quality or 15 hours at high quality. No built in radio but could record from any audio source. It’s only drawbacks were that It took too much power so no batteries, it was only AC powered and it was very complicated. Sean became our resident expert on this product and we all passed every troubleshooting call to him (sorry Sean). In 2000, we introduced the VersaCorder Tape Recorder – It recorded at regular speed or ¼ speed and had a multi-event programmable timer. We carried this recorder up until 2014 and still receive requests for it, but alas no one is making parts for cassette recorders or players. Talk about a challenge. Go to a manufacturing plant and say I want to make a cassette player…. not a lot of takers. Part of this is because of the solid state digital media, but part is because cassettes and cassette parts are prone to breakage. Lots of little moving pieces that wear out over repeated use. 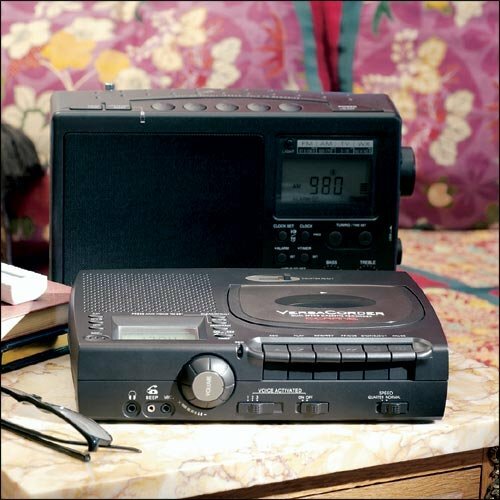 We’ve had a variety of other Recorders; the Sony MiniDisc Recorder; Sony Digital Voice Recorder; Sangean ATS818ACS; Aiwa Personal AM/FM Radio & Tape Recorder, The Radio Your Way and several others. We actually used the Aiwa to make the original 909 audio instructions. We even had a VCR patchcord that could be used to record only audio to a VHS tape. Yes, we actually helped people program their VCRs. 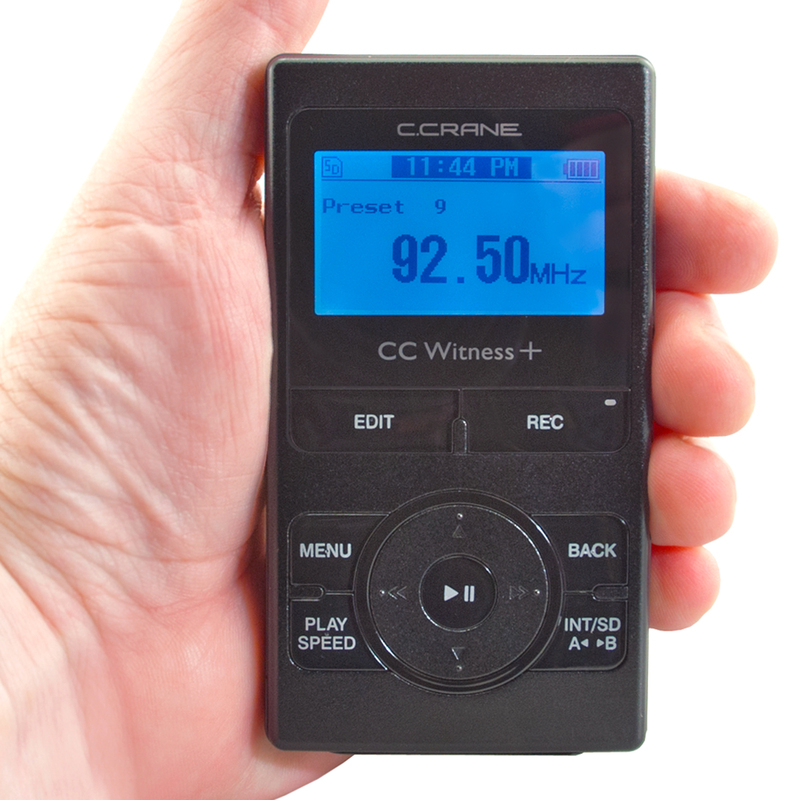 Currently the CC Witness Plus is the only recorder we carry. The original CC Witness was introduced in 2008. A solid state recorder with a built-in AM/FM Radio, line input and a 20 event timer. SD card option for extended record time or 2GB of onboard memory. It has a built-in Mic or a line in and can record from the built-in radio or any external audio source. This is great for folks who can’t stay up listening to Coast to Coast or are at work when Rush is on. It’s kind of like DVR for radio. What does the future of recording look like for C. Crane? Likely a culmination of our past successes and learning experiences mixed with customer feedback. We want to know – how and what do you record? Have you “hacked” a recording product to make it work for something other than what it was designed it for? Or have you come up with something novel on your own? Leave a comment and let us know. Extended play, Long Play Recorder, Radio Recording, Recording, Slow Speed Recording. I used to record lectures in school and go home to transcribe and replay multiple times if need be. Had to do this! Ok sorry to be the dummy but there’s no tape so it’s digital? and stores how much? After Christmas more time to cogitate. I believe it stores up to 8gb external + 2gb internal, which depending on the recording quality equals roughly ~50 hours. Not bad. I love mine! I BUY THEM, CONVERT THEM TO MP3’s (for historical preservation) AND I WOULD SEND YOU BACK THE MP3s FOR FREE. FREE ART BELL RADIO SHOW CONVERSIONS FOR YOU!